This is my version of the classic Vietnamese dish Ga Ro Ti using the essential Vodka 5-Spice Marinade. There are many variations for making this scrumptious dish with some opting to bake it. That technique is good too but I like the pan-cook method because it’s faster and I can easily thicken the marinade into a rich caramelly sauce. We don’t waste any of this delicious sauce at my house; we mix our rice right in the pan and serve a “dirty” rice with the savory and sweet chicken. Try it–it’s absolutely scrumptious! Trim chicken of any excess fat and cut into large evenly sized chunks. Add the chicken to a large bowl. Peel garlic cloves and crush with a knife. Add garlic, Vodka 5-spice marinade or powder, soy sauce, sugar, black pepper to chicken and combine well. Cover with plastic wrap and marinate in refrigerator for at least 1 hour. Overnight is best. Heat a large pan or skillet over high heat. Add olive oil. Place chicken pieces into pan and cook on each side for 2 minutes. Pour in remaining marinade, add water and cover the pan. 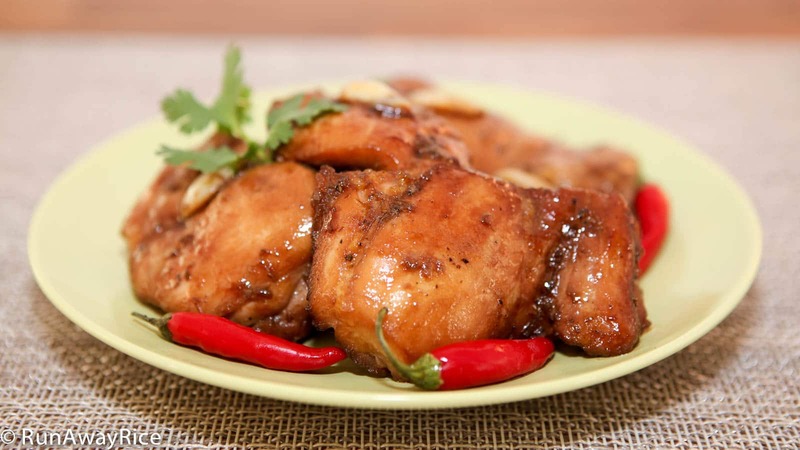 Turn heat to low and cook chicken for 6-8 minutes depending on thickness of chicken thighs. Remove lid and flip all chicken pieces. Cook for another 6-8 minutes without covering. This allows the water to slowly evaporate. Prick meat with knife or fork. If the juice runs clear, the chicken is cooked. If not, cook for a few more minutes and repeat the process. You can add a little more water if the pan starts to get dry. There should still be liquid in the pan for this final part of thickening the sauce. If there’s no liquid left, add 2 Tbsp of water and deglaze the pan. Turn the heat to high and flip the chicken pieces in the sauce coating them well. As the sauce starts to thicken, keep rotating the chicken in the sauce so they are evenly covered with sauce. This process takes just 2-3 minutes. Turn-off heat. Serve hot! I made ga ro ti today and my son loved it. I didn’t have the vodka handy, so I substituted it with 1 tsp of 5-spice powder and and 1 tbsp of chinese cooking wine. The dish is so simple to make, but the result is an absolute delight. I have made several of your other dishes and they all have been successful. I sure will try out more recipes from you in due course. I am so glad to hear you enjoyed my ga ro ti recipe. Your substitute with 5-spice powder and Chinese cooking wine is perfect. Thank you for trying this recipe and taking the time to share your results. Happy Cooking! ‘Dirty Rice’ is usually fought over at my house, my kids’ favorite treatment of rice. Can’t let all that yummyness go to waste, extra dose of iron if you use cast iron pan to saute the chicken. Thanks for another flavorful dish. The “fight” for the dirty rice happens in my house too. We all love it. I am glad to hear you enjoyed the recipe. I came across your blog by while searching for seitan. Needless to say, I love your blog! Since I don’t drink, is there any particular Vodka brand you would recommend? Thank you! OMG. This was delicious. I actually had to leave the chicken in the marinade for an extra day. This will be in our future meal planning. Marinating an extra day just makes it that much tastier. Glad you liked the recipe. Thanks for sharing your comments!